Elon Musk is on fire these days, first landing a rocket on a floating barge in the middle of the ocean and now unveiling a Mario Kart easter egg for Tesla owners. When Tesla’s Autopilot mode is activated within a Model S or Model X, similar to most GPS systems in cars, it shows your vehicle driving and its location on the dashboard screen. 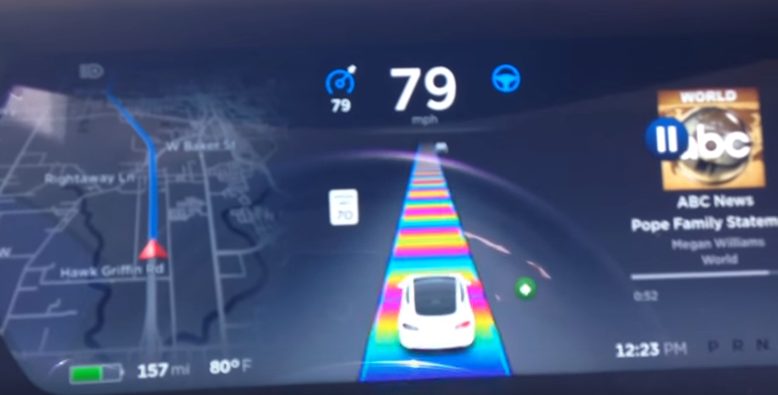 However, instead of a normal road, Tesla added a wrinkle where your vehicle can cruise down Mario Kart’s famous Rainbow Road instead. Honestly, as awesome as it looks, staring at the colorful Rainbow Road while in a vehicle in real life would probably give me a seizure so I’ll leave it to others to enjoy this unique easter egg.